MEXICO CITY, MEXICO--(Marketwired - October 26, 2016) - Nissan confirmed today the end of production of the Nissan Tsuru in Mexico by May 2017. The popular Tsuru, with more than 2.4 million sales to date, has provided accessible, economical and dependable mobility for drivers across Mexico and other markets for more than three decades. Tsuru has been an important product for Nissan to establish itself as one of the top investors and employers in Mexico. The company expects to continue its Mexican sales and production leadership despite ceasing production of the iconic sedan. "In the Mexican automotive industry, Tsuru is one of the top sales leaders," said Mayra Gonzalez, president and general director, Nissan Mexicana. 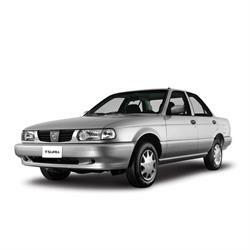 "The majority of Mexicans have some history that binds us to the Nissan Tsuru. The sedan, which has a huge following, has provided families in Mexico high-quality, reliable and durable transportation since 1984." Nissan also announced today a special commemorative version of the Nissan Tsuru will be sold beginning March 2017, with only 1,000 units available. The company will also continue to support Tsuru customers by offering service and parts for the repair and maintenance of its vehicles for the foreseeable future. Nissan confirmed that although no direct substitute for the Tsuru is planned, the company will direct customers toward models like the Nissan Versa, the industry's sales leader, as well as other models like Tiida, through their different available versions. J.D. Power awarded Nissan Tsuru the highest level of customer satisfaction in its 2013 and 2014 Mexican Vehicle Ownership Satisfaction Study (MVOSS) that evaluated customer satisfaction in the subcompact category. Nissan Mexico's overall production volume will not be affected by the Tsuru announcement due to production increases at the company's two Aguascalientes plants, including the recently introduced Nissan Kicks. Additionally, the new Daimler and the Renault-Nissan Alliance joint-venture manufacturing complex, COMPAS (Cooperation Manufacturing Plant Aguascalientes), will start production in late 2017. The COMPAS plant will allow Nissan to surpass the 1 million manufacturing benchmark in Mexico before the end of the decade and, when it's at full capacity, the company will add an additional 3,600 employees to its 15,000 team members in Mexico. Tsuru has been an important product for Nissan to establish itself as one of the top investors and employers in Mexico.